J'interviendrai jeudi 3 février à l'Université Californienne de San Diego pour y présenter mes travaux de thèse. Je présenterai quelques villes en 3D dans les mondes virtuels ce qui me permettra, ensuite, d'alimenter une discussion sur les questions et problématiques sociologiques que ces solutions socio-techniques peuvent soulever. J'aurai devant moi des chercheurs aux compétences souvent techniques et artistiques, qui ne sont pas forcément tous familiarisés avec les sciences humaines. Ce sera donc l'occasion d'expliquer comment un sociologue peut se munir des ressources qu'ils utilisent. Tout cela en anglais, pour une première ! 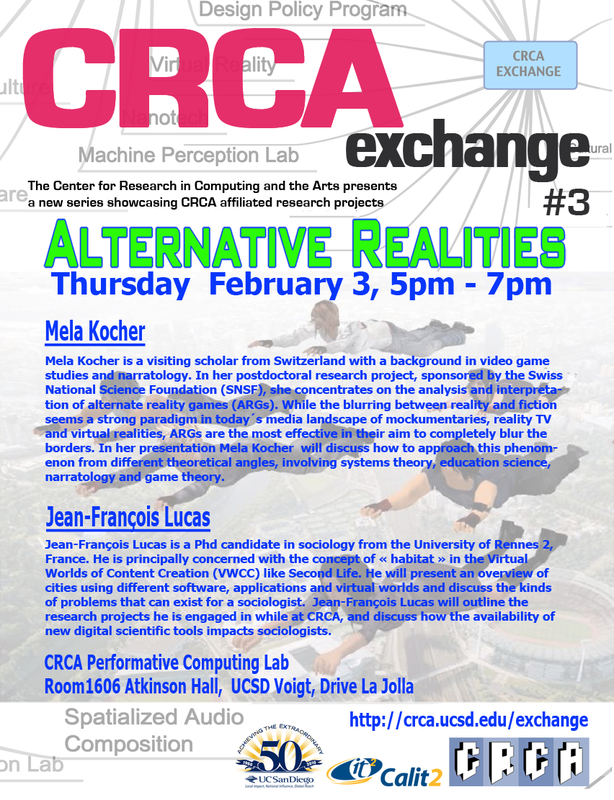 Mela Kocher is a visiting scholar from Switzerland with a background in video game studies and narratology. In her postdoctoral research project, sponsored by the Swiss National Science Foundation (SNSF), she concentrates on the analysis and interpretation of alternate reality games (ARGs). While the blurring between reality and fiction seems a strong paradigm in today´s media landscape of mockumentaries, reality TV and virtual realities, ARGs are the most effective in their aim to completely blur the borders. In her presentation Mela Kocher will discuss how to approach this phenomenon from different theoretical angles, involving systems theory, education science, narratology and game theory. Jean-François Lucas is a Phd candidate in sociology from the University of Rennes 2, France. He is principally concerned with the concept of « habitat » in the Virtual Worlds of Content Creation (VWCC) like Second Life. He will present an overview of cities using different software, applications and virtual worlds and will discuss the kinds of problems that can exist for a sociologist. Jean-François Lucas will outline the research projects he is engaged in while at CRCA, and discuss how the availability of new digital scientific tools impacts sociologists. 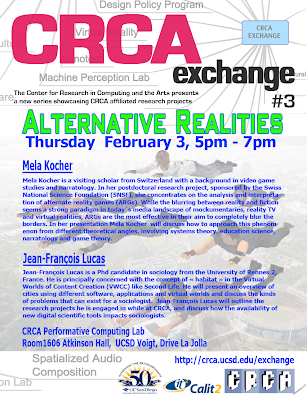 The CRCA Exchange series is supported by The Center for Research in Computing and the Arts, in conjunction with Calit2 and the UCSD 50th Anniversary.